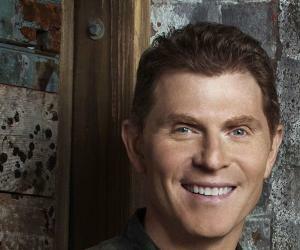 Bobby Flay is a celebrity chef who has hosted several shows on the Food Network television channel. This biography of Bobby Flay provides detailed information about his childhood, life, achievements, works & timeline. Robert William “Bobby” Flay is a celebrity chef who has hosted several popular cookery shows on the television channel, Food Network. He is most famous for his innovative style of cooking and for his love for traditional Southwestern and Mediterranean cuisines. The owner of a chain of successful restaurants, Flay is someone who not only converted a childhood passion into a fulltime profession, but also proved to the world that it is very much possible to reach the pinnacles of success doing what you love to do the most. He developed an interest in cooking from a young age and wanted an easy-to-use oven when he was eight. Finding a job at a fast food restaurant seemed to be the most appropriate option for him as a teenager. He attended the French culinary Institute and received his degree in culinary arts. He eventually became a partner at the Mesa Grill where he once worked as an executive chef—this was just the first step in becoming the proud owner of a chain of restaurants. He has appeared in numerous cookery shows on the Food Network and served as the Iron Chef on the show ‘Iron Chef America’. He is also the author of several cookbooks. He was born to Irish American parents, Bill and Dorothy Flay who divorced when Bobby was young. He was raised in an affluent neighbourhood. He loved the kitchen from a young age—he managed his mother’s grocery lists and liked to make snacks after school. He wanted an easy to use oven for Christmas when he was eight. He was not interested in academic pursuits and dropped out of school when he was 17 years old. In 1982, he was offered a job of making salads at Joe Allen Restaurant in New York. His father, a partner at the restaurant had ordered the boy to work there. 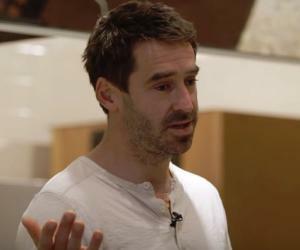 Joe Allen was thoroughly impressed by the young man’s work and arranged for him to attend the French Culinary Institute. He graduated from the institute in 1984 with a degree in culinary arts. He started working at the Brighton Grill where he was made the executive chef when the executive chef was fired. But he could not manage and quit. He found work as a chef at Bud and Jams under the renowned restaurateur Jonathan Waxman who introduced Flay to southwestern and Cajun cuisine. He credits Waxman for having greatly influenced his career. For a short while he tried working as a stockbroker but found the experience to be highly unfulfilling. He started working as the executive chef at the Miracle Grill in 1988 and held the position till 1990. The restaurateur Jerome Kretchmer who was on the lookout for a southwestern style chef was highly impressed by Flay’s cooking and appointed him as the executive chef at Mesa Grill. He became a partner in Mesa Grill in 1991. After a couple of years, in 1993 he opened Bolo Bar & Restaurant along with a partner. He established the Bobby Flay Scholarship in 2003 which is awarded to a student in the Long Island City Culinary Arts Program for a course in the French Culinary Institute. Over the years he continued adding more restaurants to his chain which included a second Mesa Grill in Las Vegas in 2004, Bar American in 2005, and a third Mesa Grill in the Bahamas in 2007. The first Bobby’s Burger Place was opened in New York in July 2008 followed by another one in New Jersey in December the same year. Over the next several years, branches of the restaurant were opened at seven more locations. The largest Bobby’s Burger Place was opened in Maryland in June 2012. 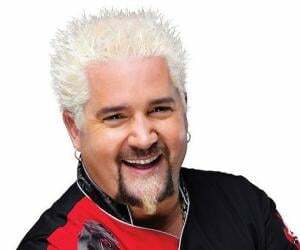 A prolific television personality, he has hosted 13 cookery shows and specials on Food Network which include ‘Boy Meets Grill’, ‘BBQ with Bobby Flay’, ‘The Best Thing I Ever Ate’, and ‘Bobby’s Dinner Battle’. He has also appeared with Emeril Lagasse on his show ‘Emeril Live’ and with Paula Deen on her program ‘Paula's Party’. He is also the author of several cookbooks like ‘Bobby Flay's Bold American Food’ (1994), ‘Bobby Flay's Boy Meets Grill’ (1999), ‘Bobby Flay's Grilling For Life’ (2005), and ‘Bobby Flay's Burgers, Fries and Shakes’ (2009). Bobby Flay is a celebrity chef who has hosted a number of television cookery shows, has several cookbooks to his credit and is the owner of an ever-expanding chain of restaurants. In addition he also has his own lines of signature sauces, spices and cookware. His restaurant Mesa Grill was adjudged New York Magazine Gael Greene’s Restaurant of the Year in 1992. 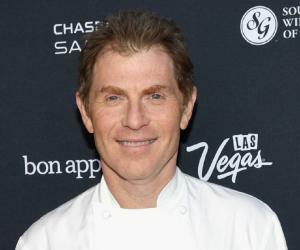 The television program ‘Bobby Flay’s Bold American Food’ won the International Association of Culinary Professionals Award for Design in 1995. He has been married thrice. His first wife was Debra Ponzek who was also a famous chef. The couple married in 1991 and divorced in 1993. His second marriage to Kate Connelly in 1995 also ended in divorce. He married actress Stephanie March in 2005. The couple separated in 2015.